"4/3" redirects here. For 4:3 image aspect ratio, see Aspect ratio (image) § 4:3 standard. The Four Thirds System is a standard created by Olympus and Eastman Kodak for digital single-lens reflex camera (DSLR) and mirrorless camera design and development. The system provides a standard that, with digital cameras and lenses available from multiple manufacturers, allows for the interchange of lenses and bodies from different manufacturers. U.S. Patent 6,910,814 seems to cover the standard. Proponents describe it as an open standard, but companies may only use it under a non-disclosure agreement. Unlike older single-lens reflex (SLR) systems, Four Thirds was designed from the start to be entirely digital. Many lenses are extensively computerised, to the point that Olympus offers firmware updates for many of them. Lens design has been tailored to the requirements of digital sensors, most notably through telecentric designs. The size of the sensor is significantly smaller than for most DSLRs and this implies that lenses, especially telephoto lenses, can be smaller. For example, a Four Thirds lens with a 300 mm focal length would cover about the same angle of view as a 600 mm focal length lens for the 35 mm film standard, and is correspondingly more compact. Thus, the Four Thirds System has crop factor (focal length multiplier) of about 2, and while this enables longer focal length for greater magnification, it does not necessarily aid the manufacture of wide angle lenses. The image sensor format, between those of larger SLRs and smaller point-and-shoot compact digital cameras, yields intermediate levels of cost, performance, and convenience. The name of the system stems from the size of the image sensor used in the cameras, which is commonly referred to as a 4/3" type or 4/3 type sensor. The common inch-based sizing system is derived from vacuum image-sensing video camera tubes, which are now obsolete. The imaging area of a Four Thirds sensor is equal to that of a video camera tube of 4/3 inch diameter. The usual size of the sensor is 18 mm × 13.5 mm (22.5 mm diagonal), with an imaging area of 17.3 mm × 13.0 mm (21.63 mm diagonal). The sensor's area is about 30–40% smaller than APS-C sensors used in most other DSLRs, but still around 9 times larger than the 1/2.5" sensors typically used in compact digital cameras. Incidentally, the imaging area of a Four Thirds sensor is almost identical to that of 110 film. The emphasis on the 4:3 image aspect ratio sets Four Thirds apart from other DSLR systems, which usually adhere to the 3:2 aspect ratio of the traditional 35mm format. However, the standard only specifies the sensor diagonal, thus Four Thirds cameras using the standard 3:2 aspect ratio would be possible; notably newer Panasonic Micro Four Thirds models even offer shooting at multiple aspect ratios while maintaining the same image diagonal. For instance, the Panasonic GH1 uses a multi-aspect sensor designed to maximize use of the image circle at 4:3, 3:2, and 16:9; each ratio having a diagonal of 22.5 mm. Sensor aspect ratio influences lens design. For example, many lenses designed by Olympus for the Four Thirds System contain internal rectangular baffles or permanently mounted "petal" lens hoods that optimise their operation for the 4:3 aspect ratio. In an interview John Knaur, a Senior Product Manager at Olympus, stated that "The FourThirds refers to both the size of the imager and the aspect ratio of the sensor". He also pointed out the similarities between 4:3 and the standard printing size of 8×10 as well as medium format 6×4.5 and 6×7 cameras, thus helping explain Olympus' rationale on choosing 4:3 rather than 3:2. An Olympus E-420 camera, sold with a very thin 25mm "pancake" lens. The E-4XX series was advertised as the smallest true DSLR in the world. The smaller sensor size makes possible smaller and lighter camera bodies and lenses. In particular, the Four-Thirds system allows the development of compact, large aperture lenses. Corresponding lenses become larger, heavier and more expensive when designed for larger sensor formats. Telecentric optical path means that light hitting the sensor is traveling closer to perpendicular to the sensor, resulting in brighter corners, and improved off-center resolution, particularly on wide angle lenses. Because the flange focal distance is significantly shorter than those on Canon FD, Canon EF, Nikon F and Pentax K, lenses for many other SLR types including the old Olympus OM System can be fitted to Four Thirds cameras with simple mechanical adapter rings. Such mechanical adapter rings typically require manual setting of focus and aperture. A series of tests provides a demonstration. The main disadvantage of a smaller sensor, with a pixel count that matches a larger sensor, is the reduction in incoming light hitting the light sensitive part of each pixel of the sensor. This is true even if the Four Thirds camera and lens are properly designed to focus all captured light onto the smaller light circle circumscribing the smaller sensor. The reason is that a smaller pixel has a proportionately smaller light sensitive area because the pixel loses a larger proportion of its total area to secondary circuitry and edge shading than a larger pixel. With less captured light to work with each pixel output voltage requires additional amplification with associated higher signal noise, resulting in increased chromatic and color noise as well as reduced dynamic range. A telecentric lens design helps reduce this problem but still leaves a smaller sensor, with smaller pixels, more sensitive to the angle of incoming light, among other things producing a more pronounced image corner light fall off. The resolution of a sensor is often measured as the total sensor pixel count in Mega Pixels or MP. From an image resolution point of view, a large sensor consisting of small sensor pixels is therefore desirable. The resolution of a lens is typically defined as the ability to produce an image of, for example, 100 black and white line pairs per millimeter. This corresponds to a line pair distance of 10 µm. Since this is also in the neighborhood of how small pixels can be manufactured today, this puts a limit on what image resolution can be achieved in a Four Thirds image sensor. Smaller pixels consequently also place a greater demand on lens resolution in order to be able to take advantage of the higher image-sensor resolution, although a smaller pixel active area reduces the averaging effect and allows a better sampling of high spatial frequencies. The overall change in resolution is a highly non-trivial problem which cannot be summarized in a couple of short general principles. Complex numerical simulation is required to find the best balance between pixel size and pixel active area. To get the same angle of view as with a larger sensor, the focal length of the lens used with the Four Thirds sensor needs to be shorter. However, to get the same depth of field and light gathering capability as with the larger sensor, the lens aperture needs to be kept constant, i.e. the focal ratio of the lens must be smaller on the Four Thirds system to give the same depth of field and image noise. Since it is more difficult to produce faster lenses (lenses with smaller focal ratios), it can be difficult or impossible to find a lens that produces as shallow a depth of field, and gathers as much light, as an equivalent lens on larger formats. For instance, a 35 mm full frame DSLR can match the depth of field of a Four Thirds camera by closing down the aperture by two stops; but it may be more difficult or impossible for a Four Thirds System to match the shallow depth of field of a 35 mm full frame camera using a fast lens. 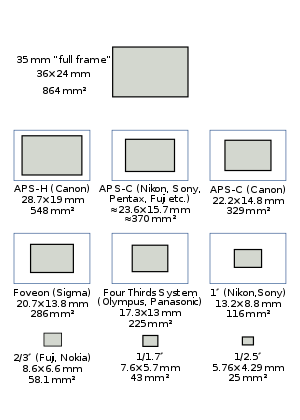 Most Four Thirds cameras (notably those manufactured by Olympus) use an aspect ratio of 4:3 rather than 3:2; newer models offer cropping to 3:2, but this results in a reduced image diagonal (i.e., the effective crop factor is then 2.08). This does not imply a commitment to end user products by each company. Historically, only Leica, Olympus, and Panasonic have produced bodies. Olympus and Leica/Panasonic have made dedicated Four Thirds lenses, and Sigma makes adapted versions of their "DC" lenses for APS-C format DSLRs. Kodak once sold sensors to Olympus for use in their Four Thirds bodies, but the newer Olympus Four Thirds cameras used Panasonic sensors. The majority of Four Thirds System cameras and Four Thirds lenses are made by Olympus. Many Four Thirds cameras use "sensor-shift" in-body image stabilization, making the need for image stabilization technology in its lenses unnecessary. All Four Thirds cameras also incorporate an automatic sensor cleaning device, in which a thin glass filter in front of the sensor vibrates at 30 kHz, causing dust to fall off and adhere to a piece of sticky material below. Olympus' E-system camera bodies are noted for their inclusion of a wide range of firmware-level features and customization, good JPEG engine, and compact size. Because of the smaller format of Four Thirds, the viewfinders tend to be smaller than on comparable cameras. Four lenses for the Four Thirds System. From left to right, three Olympus zooms (40–150mm, 11–22mm and 14–54mm) and a Sigma prime (30mm). The Four Thirds lens mount is specified to be a bayonet type with a flange focal distance of 38.67 mm. There are currently around three dozen lenses for the Four Thirds System standard. Olympus also made 1.4× and 2× teleconverters and an electronically coupled extension tube. Sigma has adapted 13 lenses for the Four Thirds System, ranging from 10 mm to 800 mm, including several for which no equivalent exists: the fast primes (30 mm f/1.4 and 50 mm f/1.4) and extreme telephoto (300–800 mm f/5.6). As of 2014 all Sigma lenses for the Four Thirds System have been discontinued. Leica has designed four lenses for the Four Thirds System: fast and slow normal zooms and a 14–150 mm super-zoom, all with Panasonic's image stabilization system, and an unstabilized f/1.4 25 mm prime. These are manufactured and sold by Panasonic. An official list of available lenses can be found on Four-Thirds.org web site. As for the system itself, it was silently discontinued in favor of the Micro Four Thirds System. In August 2008, Olympus and Panasonic introduced a new format, Micro Four Thirds. The new system uses the same sensor, but removes the mirror box from the camera design. A live preview is shown on either the camera's main liquid-crystal display or via an electronic viewfinder, as in digital compact cameras. Autofocus is accomplished via a contrast detection process using the main imager, again similar to digital compact cameras. The goal of the new system is to allow for even smaller cameras, competing directly with higher-end point-and-shoot compact digital cameras and lower-end DSLRs. The smaller flange focal distance allows for more compact normal and wide angle lenses. It also facilitates the use, with an adapter, of lenses based on other mounting systems, including many manual focus lenses from the seventies and eighties. In particular, Four Thirds lenses can be used on Micro Four Thirds bodies with an adapter, however, "all of the functions of the Micro Four Thirds System may not always be available." ^ "Kodak and Olympus join forces". DPReview.com. DPReview.com. 2001-02-13. Retrieved 2007-11-07. ^ "Benefits". Four Thirds Consortium. Retrieved 2008-12-10. Details of the Four Thirds System standard are available to camera equipment manufacturers and industry organizations on an NDA basis. Full specifications cannot be provided to individuals or other educational/research entities. ^ a b "No more compromises: The Four Thirds Standard". Olympus. Europe. Archived from the original on 2011-07-14. Retrieved 2009-04-17. ^ "The Four Thirds Standard". Four Thirds Consortium. 2008. Retrieved 2009-04-17. ^ "Four Thirds Standard" (whitepaper). Four Thirds Consortium. 2009. Retrieved 2009-10-09. ^ Utpott, Björn, G1 sensor vs GH1 sensor (JPEG diagram), PBase . ^ Knaur, John (October 1, 2002), Interview, A Digital Eye, archived from the original on 2002-12-05 . 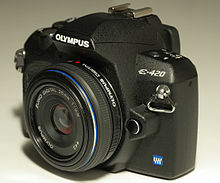 ^ Olympus E400 Digital Camera Review, Let’s go digital . ^ "OMs on E1", Cornucopia, Biofos . ^ Full Frame Sensor vs Crop Sensor – Which is Right For You?, Digital Photography School . ^ "Depth of Field Equations". www.dofmaster.com. Retrieved 12 April 2018. ^ "Specs - Lumix G Digital Camera: DMC-GX7| Panasonic Australia". Retrieved 2015-08-28. ^ "DPReview E-30 conclusions page". 2009-04-09. ^ "DPReview E-510 review". 2009-04-09. ^ Wrotniak, Lens list . ^ Butler, Richard (March 10, 2017). "In memoriam: Olympus brings down the curtain on the legacy Four Thirds system". Digital Photography Review. Retrieved March 16, 2017. ^ "Olympus E-System Zuiko Digital Interchangeable Lens Roadmap" (PDF). UK: Olympus. Archived from the original (PDF) on 2007-10-15. Retrieved 2007-11-29. ^ "Olympus Lens Tests". SLRgear. ^ "Olympus Zuiko 12–60mm 1:2.8–1:4 lens review". DPReview. ^ "Lens list". Asia: Olympus. Retrieved 2009-08-20. ^ Lens list, Four Thirds . ^ Micro Four Thirds Official benefits list. Wikimedia Commons has media related to Four Thirds system.